This is the Oral Cavity section about the structures in the mouth, including the tongue, salivary glands, tonsils and teeth. The lower lip is just one of the structures of the human oral cavity. See also the links to pages about other parts of the mouth. The lips are fleshy folds of tissue around the opening of the mouth. They are covered with skin on the outside and a mucous membrane on the inside. The lower-lip is also known as the inferior lip. It is the lip closest to the chin (as opposed to closest to the nose). 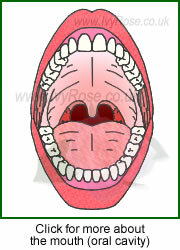 The lower lip is just one of the structures in the human oral cavity. See also the links to pages about other parts of the mouth. Information about the structures of the mouth, tooth anatomy and teeth names is relev ant to the section about digestion. The topics of digestion and teeth are included in some school e.g. GCSE and/or A-Level courses in subjects such as biology and human biology and in other courses that include human anatomy & physiology, diet, nutrition, and other health sciences.